THE ALTAR OF THE AZTECS, (Jan. 31). – “The Altar of the Aztecs” is a picturesque and romantic story dealing with strange adventures encountered by Edwin Dalton, a young American mining engineer in the ancient silver mines of the Aztecs in Sonoma, Old Mexico. It starts with a brilliant social function, given by Juan Caballes, an Americanized descendant of the old Spanish Aztecs (sic), and now a wealthy mine owner on the New York Stock Exchange. This interesting story is carried through, scene after scene, of original and gripping incidents and picturesque settings, until at last the hero finds himself imprisoned in the tumble-down silver mine in far-off Condilleras (sic), Mexico. A strong love story is interwoven throughout, which makes this at once one of the most sensational and vivid stories yet released this season. “THE ALTAR OF THE AZTECS” (Selig), Jan. 31. – An unusual picture with an extremely interesting atmosphere. It’s naturally a love story and deals with the discovery of a rich gold ledge once known to the Aztecs; but long lost. 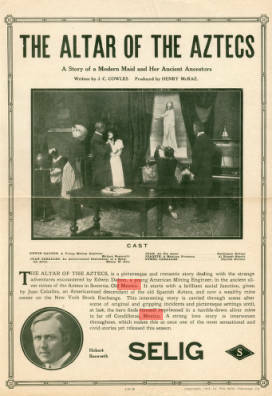 It probably was suggested by a real temple of pre-historic Mexico some good views of which are included; but its author has carefully laid out his plot and the picture shows none of the haphazard looseness that has begun to seem almost the rule with photoplays made to order. It opens in New York and with some perfect interior sets in the home of a rich merchant whose daughter resembles an old painting of an Aztec princess, her ancestress. This fact plays no part in the story, it is brought in merely for atmosphere, an atmosphere, by the way, that the picture doesn’t pretend to develop. In the novel of this type the girl usually has something to do with finding the mine; is looked upon by the natives as a goddess or something of that kind and the scenario writer perhaps knew that the spectator would follow the well-known clue and that his picture would get an added touch of mystery. We commend him for it, but wish that he could have taken the time to make two reels or more; he shows that he can be interesting. The author is J. C. Cowles and he knows how to make an acceptable picture, and Henry McRae, its producer can put one over. Hobart Bosworth plays the American mining engineer who discovers the “lost ledge” and so wins the girl, who is played by Phyllis Gordon. Henry W. Otto plays the girl’s father and F. Galves and A. E. Garcia have parts as Mexicans. The photography is of the best and the offering plainly took the audience into camp. The sub-titles are not just what was wanted. La ficha filmográfica la tomo de la circular que imprimió la Selig para publicitar el filme, el cual era la historia de una moderna trabajadora doméstica y sus ancianos ancestros. Productor: Selig (USA, 1913). Productor: Henry McRae. Argumento: J. C. Cowles. Intérpretes: Hobart Bosworth (Edwin Dalton, un joven ingeniero de minas), Henry W. Otto (Juan Caballes, un descendiente de ¿azteca español? ya americanizado), Ferdinand Galvez (Juan, un viejo azteca), Al Ernest García (Joaquín, un capataz mexicano), Phyllis Gordon (Ethel Caballes). También hubo en el primer cine norteamericano de “aztecas”, entendiendo por éstos a una raza ubicua en la geografía y la historia mexicanas, pues podían ser actuales y fronterizos. Antiguos o modernos, esos “aztecas” ilustraban un exotismo de ritos viejos y crueles, sacrificios humanos y tesoros u otras riquezas de las que sólo ellos conocían el secreto, pero no la utilidad. De ritos y sacrificios, debieron tratar The Aztec Sacrifice (1910) y The Altar of the Aztecs (1911); de riquezas incógnitas, The Aztec Treasure (1914), The Lost Ledge (1915) y The Secret of the Dead (1915).